A new month, a new blog post! 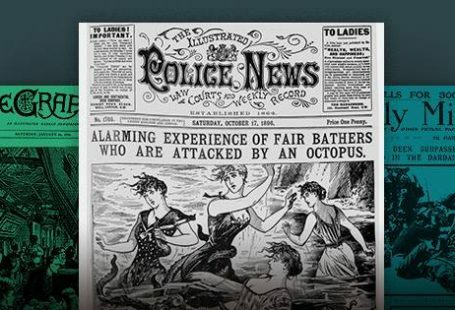 Today we’re exploring three events that took place in August – one from 150 years ago, one from 125 years ago, and the last from 75 years ago. As we kick off this month’s theme of occupations, we are happy to remember the British physicist and chemist Michael Faraday (22 September 1791-25 August 1867) who died 150 years ago this month. Of all occupations, those relating to the sciences have been some of the most influential and impactful in modern history. Faraday’s work would prove fundamental to the study of electromagnetism and included the discovery of benzene, the invention of an early Bunsen burner, and the discovery of Faraday’s law of induction, which is a basic law of electromagnetism. 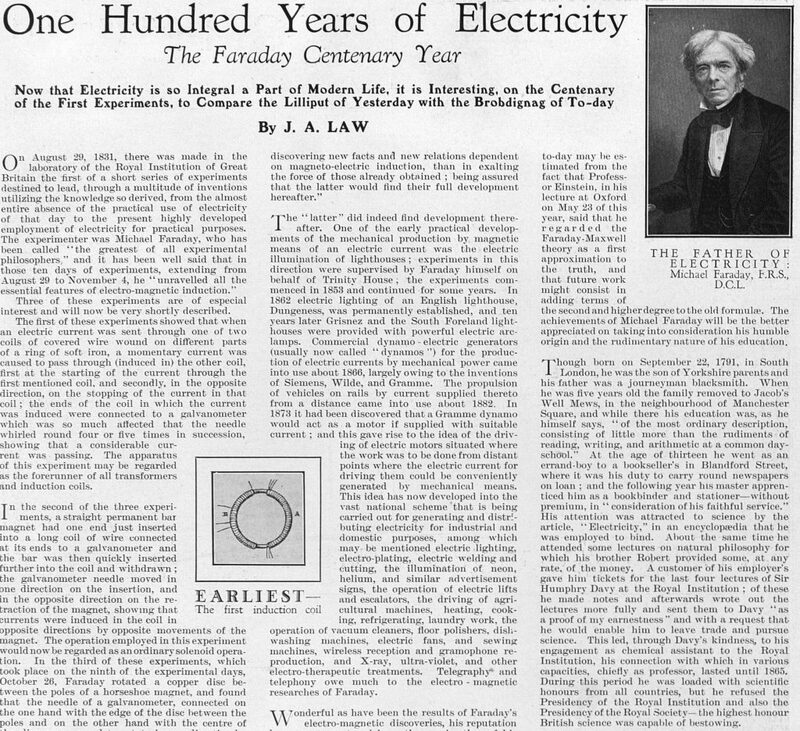 On the occasion of Professor Faraday’s death, numerous papers printed lengthy tributes to the scientist and inventor. On the centenary of his discovery, now known as Faraday’s law of induction, St. Andrews Citizen printed an article on his life and great achievement in magnetic induction. 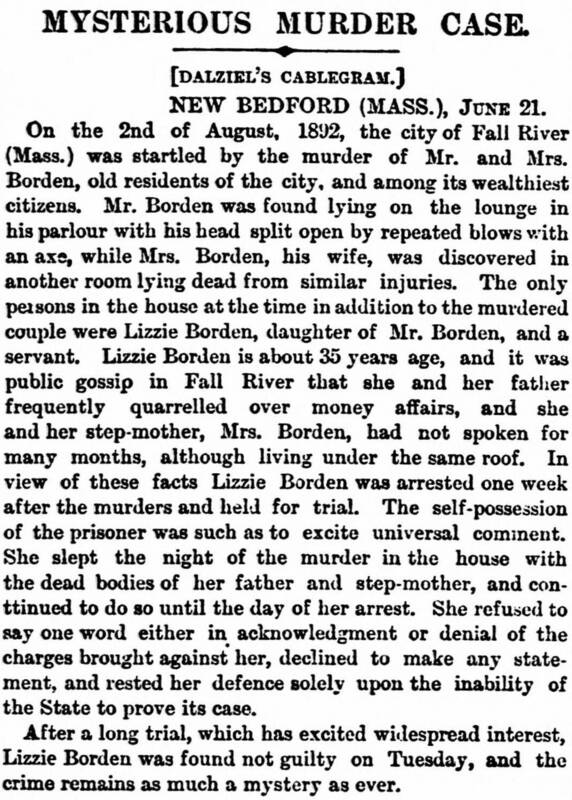 This month marks the 125th anniversary of the discovery of the murders of Lizzie Borden’s father and stepmother, on 4 August 1892 in Fall River, Massachusetts. 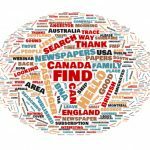 Use the filters to the left of the results to narrow your results by date, newspaper title, country, region, county, place, type, and public tags. Andrew and Abby Borden both suffered gruesome deaths: the instrument of death was a hatchet, with which Andrew was struck some 10 or 11 times and Abby 17 times. 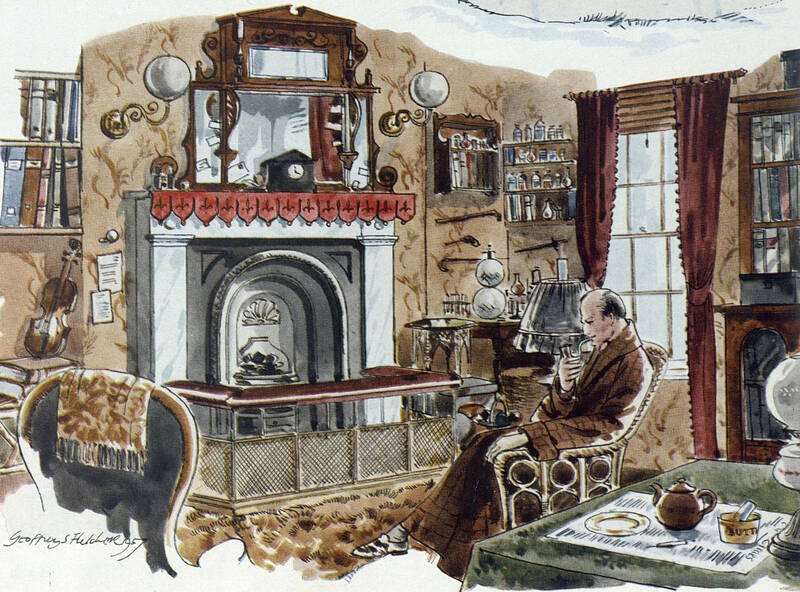 At the time of his death, Andrew Borden’s estate was valued at $300,000 (about $8,000,000 in 2016). As a prominent businessman, his death, and that of his wife, shook up the New England town of Fall River. The case had all the hallmarks of front-page news: family fights, accusations of a gold-digging stepmother, speculations of murder motivated by money, the charge of parricide, and inconsistent testimonies. From a short account of the murder and investigation printed in the Lisburn Herald, and Antrim and Down Advertiser, the growing intrigue of the case is well encompassed. 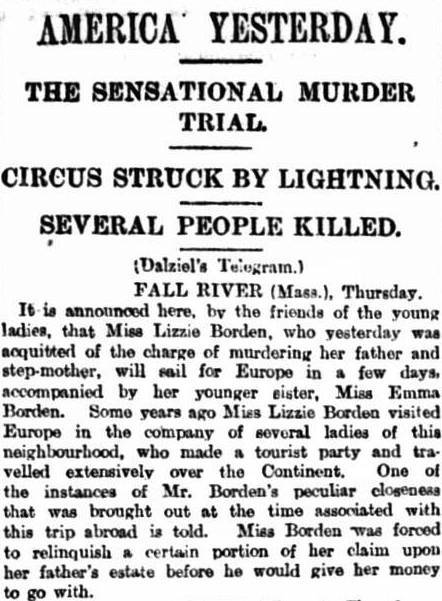 Lizzie Borden’s trial took place the following June, and on 20 June 1893, Lizzie was acquitted. 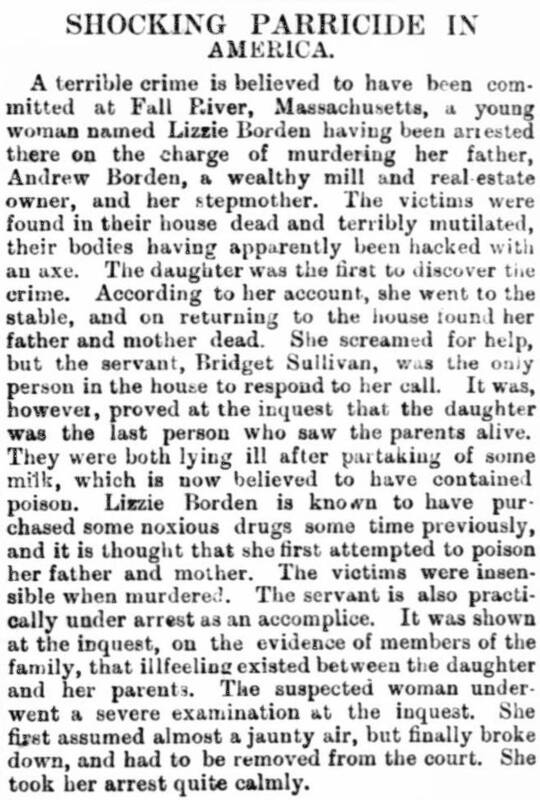 The acquittal of Lizzie hardly put the matter to rest – with no further arrests, her acquittal only fuelled further speculation as to the murders and their motivation. 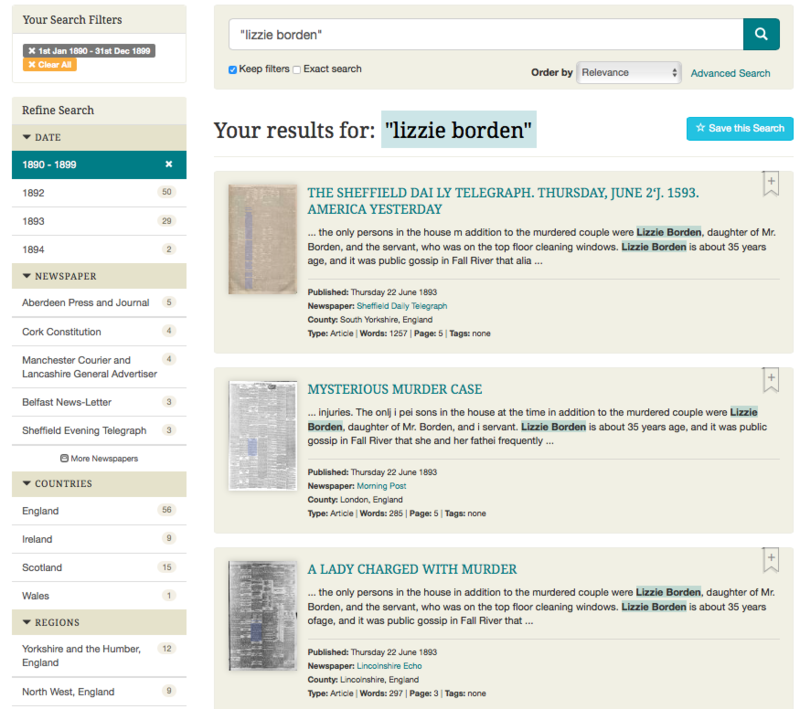 The case of the Bordens and, particularly, Lizzie’s suspected role in it has remained a popular topic of speculation in the criminal history of the United States, even more than one hundred years after the murders. 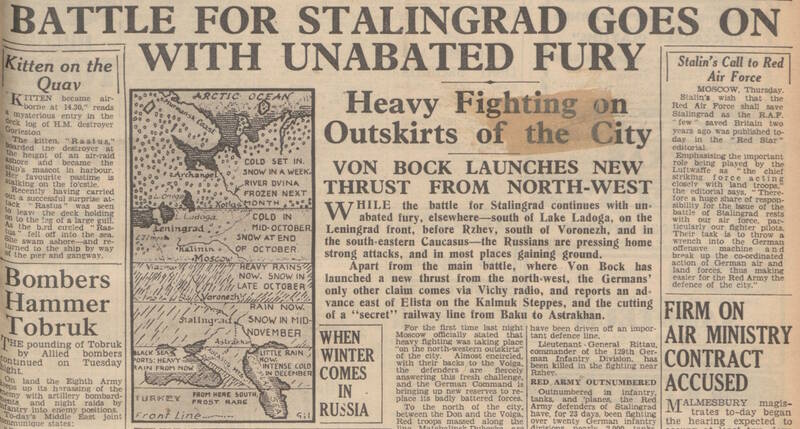 Seventy-five years ago, on 23 August 1942, the Battle of Stalingrad commenced. It would prove to be a decisive victory for the Soviet Union – and the Allies – against Germany, from which Germany was unable to recover. This Second World War battle would also be considered the bloodiest in the history of warfare. 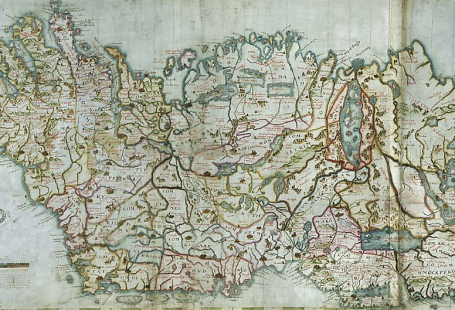 Unsurprisingly for a battle considered the bloodiest in history, the conflict spanned over five months and involved an estimated 2.2 million individuals. 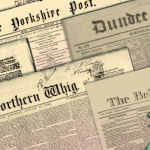 Newspapers covered the battle as closely as they could. On 17 September 1942, the battle made the front page of the Coventry Evening Telegraph.